Lovat hit half-dozen for the second week in a row in the Marine Harvest Premiership when they ran out 6-3 winners at Inveraray. This reduces Kyles Athletic's lead to just goal difference after the Tighnabruich side lost their 100% record in a 1-1 draw with visitors Fort William. Newtonmore also kept in touch with a 4-0 home success over Glenurquhart. Lochaber's 3-1 defeat of Oban Camanachd at Spean Bridge, combined with Fort's point, leaves Kingussie, who had no game, bottom of the Premiership table. Meanwhile, two cup-holders made first-round exits. In the Balliemore Cup, shinty's intermediate championship, Skye lost a penalty shoot-out on Bute after a 3-3 draw. And Kyles succumbed 3-0 away to Glenurquhart in the Aberdein Considine Sutherland Cup, the reserve team championship. At the Winterton, the cornerstone of Lovat's defeat of Inveraray was a hat-trick from Greg Matheson with two more from Fraser Gallacher and one from Kevin Bartlett. Euan McMurdo scored two and Lewis MacNicol one for Inveraray who at one stage held resurgent Lovat to 3-3, but a strong second-half saw the Kiltarlity side cruise home. This result comes just a week after Lovat eclipsed Kingussie 6-1 at Balgate. Just five minutes from full-time, Kyles' encounter with Fort William was still goalless so when Grant Irvine broke the deadlock, the home fans must have thought that Kyles were going to maintain their 100% record. But just two minutes later, Graham Campbell grabbed an equaliser to give Fort a point to take them off bottom. 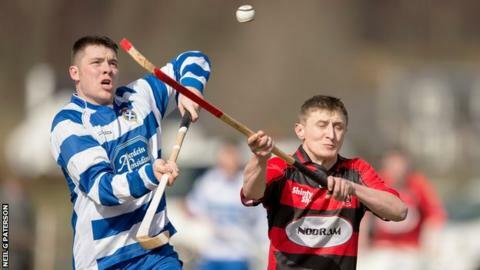 Next in line for the basement would have been Lochaber, but for their 3-1 success over Oban Camanachd in the meeting of the two newly-promoted sides. Stuart Callison got an early opener for Lochaber but Andrew McCuish equalised. There then followed almost a full goal-less hour before Conor Sweeney and Brian MacDonald put both points in the bag for Lochaber. However, local rivals Newtonmore have no such problem and the champions made short work of a Glenurquhart side whose good start to the season ran into trouble at the Eilan. Glen MacKintosh scored a hat-trick for More with the other contribution from Neil Stewart just before half-time when it was 1-0. This leaves Kyles on seven points from four games, Lovat on seven from five while Newtonmore's four outings have yielded six points. At the bottom there is the unusual sight of Kingussie, with two points from their three games, trailing Fort William and Oban Camanachd on goal difference. Kingussie do have a game in hand over the four sides immediately above them. Bute have not had their troubles to seek in recent years but gained a big boost from their shoot-out victory over holders Skye in the first round of the Balliemore Cup. Skye's Chris MacLennan was first to find the net but that lead was quickly neutralised by Robert Walker and just as quickly restored by MacLennan. In the second half, Jordan Murchison made it 3-1 to Skye but Walker became Bute's hero when he completed his hat-trick in the final quarter. This sent the tie into goal-less extra-time and a shoot-out which Bute won 3-2. A Marc MacLachlan double sent Beauly on their way to a 3-0 Balliemore win over local rivals Caberfeidh. David MacLennan, Ryan Porter and Cairn Urquhart were on target for Glenurquhart's reserves over their counterparts, holders Kyles, in the Sutherland Cup, where Tayforth scored in the first minute at home to Newtonmore's second string but eventually lost 10-1.